I've always wanted to try my hand at felting but never knew how to start. I have a friend who has been felting for years and she said that all you have to do is knit/crochet a piece in wool and throw it in the washer/dryer. I doubt it's that simple. Anything more I should know before I try this out? Be sure to keep in mind that the project will shrink so you have to make it larger than what you want the finished project to be. I go by this rule I found online: Felting is not an exact science due to the many different variables, however up to 25% of the height and 15% of the width may be lost in the felting process. When you put it in the washer just let it go for 5-10 minutes and then check it to see how well it is felting and how much it has shrunk then you will know if it needs a few more minutes or a little longer. I would not let it go much longer than 10 minutes without checking it. You can always felt it more if it needs it but if you go too far, you can't unfelt it. You don't want it to shrink too much. You don't want to add acrylic to wool if you plan to felt it. The wool shrinks and tightens up, and the acrylic does NOT. Also, you can easily felt an item in your kitchen sink, which gives you more control over the shrinkage. Both heat and movement cause the felting, so wear kitchen gloves and you'll be able to use very hot water. Run hot water in your sink with a tiny bit of detergent. 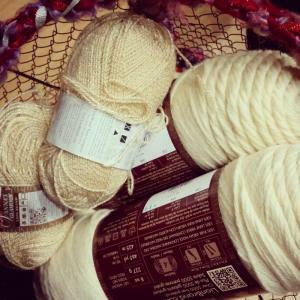 Add your crocheted item, and start swishing it around. Smush it up and move it around, and in no time, it will be shrinking. When it is nearing the size you want, just do the same thing with clear hot water to rinse it.